France and Germany both saw their gross domestic products expand over the course of the second quarter, with their expansions beating the forecasts of analysts quite comfortably. In doing so, the two financial powerhouses led the Eurozone out of recession, sending the euro higher and driving down the value of so-called “safe haven” currencies. The gross domestic product for the euro zone as a whole expanded by 0.3%, much of which is owed to the expansions in the German and French economies, which grew by 0.7% and 0.5% respectively. 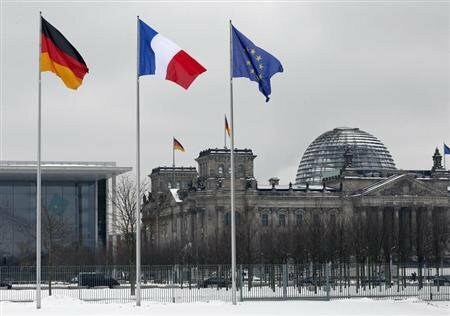 Analysts had originally forecast that the German GDP will grow by 0.5%, whilst its French counterpart would see somewhat less impressive gains of 0.2%. With both forecasts being comfortably beaten sentiment in and around the markets which are heavily affected by Europe has increased drastically and we could now begin to see investors taking on riskier assets. A byproduct of the fresh signs of recovery from the European financial crisis has been the fall of the Swiss franc. The years the Swiss economy has benefited from investors buying incredible amounts of their currency, as it is seen as a stable and reliable place to store their wealth. In a similar way to gold moving inversely to the stock markets, the Swiss franc has traditionally risen when the euro has been in trouble and gone down when it has being going through brief spells of prosperity. At the time of writing the euro had gained 0.0019 against the Swiss franc, trading at 1.2400 after reaching a session long high of 1.2426 earlier in the day. The euro did however fall against the Great British Pound. The Stirling advanced against most of its major peers on the back of an unchanged unemployment figure for last month, which show signs that the economy in the UK is now beginning to stabilise. The Bank of England has also taken the bold step of using the nation’s unemployment rate is a benchmark for future interest rate alterations. So long as unemployment remains in the region of 7.8%, there is little chance of the central bank catching investors off guard with a sudden movement of their long-standing 0.5% interest rate. The EUR/GBP pair had seen a fall of 0.005 by early afternoon trading in New York, resulting in an asking price of 0.8540. The GBP also advanced against the USD, gaining 0.0086 to trade at 1.5528. Meanwhile the greenback lost out to the Australian dollar, the Canadian dollar and the New Zealand dollar, which were trading at 0.9137, 1.0326 and 0.8038 respectively. Gregory Bassett - Gregory previously worked for a leading financial news publication and is now assistant news editor of financialtrading.com.